The popular acronym used to remember fire extinguisher usage is “PASS” – pull, aim, squeeze, and sweep. 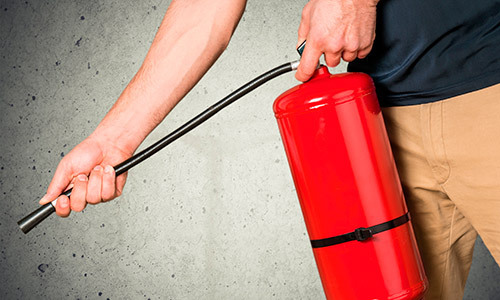 While the series of actions sounds easy enough, there’s a bit more you should know about fire extinguisher protocol to heighten the amount of fire protection you can get out of it. The first mistake that many people make when using a fire extinguisher is not removing the pin. A safety pin is inserted in every extinguisher model, to ensure there are no accidental misfires, should the extinguisher fall down or be handled inappropriately. The pin itself is on the handle – it’s noticeable for its large ring-like shape. Before attempting to use the extinguisher, the pin must be pull completely out of the device. Much like pulling the pin on a grenade activates the device, so too does a fire extinguisher only activate once the pin is pulled. Aiming a fire extinguisher may seem simple, but there are some key angling techniques that can prevent common mishaps and mistakes. Firstly, the hose must be pointed at a downwards angle, not completely towards the ground, but far enough downwards so that the spray won’t affect your face. The spray from an extinguisher is large, and if the hose isn’t pointed downwards, the spray could disrupt vision and breathing. Second, the hose should be pointed at the base of the fire only. Many people make the mistake of aiming for the top of the fire, but this does little to battle the fire itself. The next step is to activate the extinguisher by squeezing the metal handle at the top of the device. This portion is fairly simple, but it’s key to remember to squeeze the handle slowly, evenly applying pressure. Be sure to hold on to the handle and not release pressure on it until you are finished with it. Lastly, it’s important that people know exactly how to apply the agent from the extinguisher in an even way, so as to most effectively beat back the flames. Sweep the spray from side to side, evenly distributing the spray on the key areas at the base of the fire. Keep spraying until the fire is completely out, and be sure to keep a watchful eye on the remnants of the flame in case the fire re-ignites. Fire protection is reliant on educated individuals – without the knowledge to use a fire extinguisher, the device is rendered useless. Remember these tips when you encounter a fire, and your fire extinguisher will prove invaluable in beating back the flames.